Can We Save Nature by Improving Agriculture? There is an ongoing debate about how to produce food for a growing population without losing more of our wild lands. Two options are being promoted; “land sparing” where production on current agricultural lands is intensified to produce more food thereby sparing the conversion of wild lands, and “land sharing” where agriculture and wild lands are integrated and small producing parcels are intermixed with wild lands. The former strategy is championed in a paper by Phalan et al. (2011) where the authors report that more bird and tree species were negatively affected by agriculture than benefitted from it. A contrary view from Tscharntke et al. (2012) argues that the land sparing view ignores the complexity of the real world, and that the land sharing strategy would produce more ecosystem services. From these two views, a range of options expand, all of which are being researched and debated. Although land sparing can be viewed as continuing the status quo, high-yield farming on existing lands, most proponents have a higher vision, often called sustainable intensification. This takes current large-scale agricultural production and addresses its problems while continuing to strive for higher yields. Controlling erosion, improving nutrient cycling, and reducing the use of persistent toxic pesticides are among the problems to address. In addition to production problems, there are policy problems to solve if land sparing is to work, such as insuring that wild lands are actually spared as crop yields are increased. Critics are quick to point out that past increases in yield did not spare wild lands, even when laws were passed to prevent their conversion to farmland. They also have doubts that sustainable intensification will result in improved environmental quality. Land sharing adherents believe that agroecological intensification will result in fewer environmental costs and, by maintaining biodiversity, produce services such as pest control, pollination, and soil fertility. Some also incorporate non-production issues such as food security and food sovereignty into their arguments for land sharing. However, critics note that their examples are often constrained to tropical smallholder agricultural systems, “gardens” they say, or small farms producing important but specialty crops like cacao and coffee. The issues are tangled and complex. Perhaps, as Phelan et al. states and Tscharntke et al. 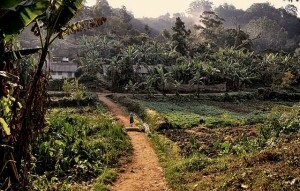 agrees with, “this requires well-informed regional and targeted solutions…more complex than currently discussed in the black-and-white land sparing vs. sharing debate.” For instance, it is reasonable to assume that the best strategy for small landholders in the tropics would be different than that for large Midwest farms. And whatever the strategy on the farm, dietary choices, food waste and trade policy, among other issues, will ultimately determine our success. To hear more on this challenge of how to improve agriculture while conserving wild lands plan to attend the CSANR symposium, Saving Nature and Improving Agriculture; Where does Nature’s Wisdom Lie?, to be held in Pullman on October 28th. This free symposium features Emma Marris, author of Rambunctious Garden: Saving Nature in a Post-Wild World and R. Ford Denison, professor in Ecology and Evolution at the University of Minnesota, and author of Darwinian Agriculture: How Understanding Evolution Can Improve Agriculture. 2 thoughts on "Can We Save Nature by Improving Agriculture?" We have to do away with the huge mono-crop culture in big agriculatural areas, where literally thousands of acres are dedicated to one crop, i.e. corn, year after year. This philosophy is encouraged and promoted by our federal subsidies programs and so it feeds on itself like a huge cancerous growth. This is another big, big issue in many ecological and sustainable arenas of concern. This is done not to feed the world, but to feed big agriculture and commerce. AJ, I agree that there would be many benefits of diversifying rotations, however it is not, in most cases, philosophy that causes this, but rather economics, spurred as you say by federal policies. There are also well organized, entrenched powers that resist this change for various reasons, not the least of which is that the whole infrastructure, on- and off-farm, is set up for corn (and soybean) production. Any change would make this investment less valuable.